REAL OCEANS | Sail about a little and see the watery part of the world. Sail about a little and see the watery part of the world. Consider a layer cake. How would you build a model that predicts the thickness of a 10 cm cube of frosting spread uniformly around the cake? If the cake is 10 cm tall and 30 cm in diameter (we’re hungry), then the frosting would contribute to a uniform “cake-level rise” of about 0.6 cm. Not particularly indulgent, but times are rough. The layer-cake model could easily become a super-simplified, super-useless metaphor for models of melting ice sheets. Consider an ocean world with one continent, no atmosphere, just nothing at all. A ball of water, with a two-km thick ice cube at the South Pole, atop the continent. Bake at 60 degrees Celsius for 200 years. Sea-level models are much more complex than our shopping guide for frosting. And they recently became more complicated. A paper in Science last month considers factors left out of modeling sea-level rise. The biggest factor is gravity. The 6,000-foot thick ice that covers much of Antarctica exerts great force on the surrounding ocean, so much so that if that gravity is redistributed, “sea level will actually fall within ~2000 km of the collapsing ice sheet and progressively increase as one moves further from this region.” If the West Antarctic sheet melts, its gravity disperses, too, releasing the water under its sway to rejoin the world’s oceans. A study published 30 years ago remarked on the ice sheet’s gravitational pull, and was then promptly forgotten. Jerry X. Mitrovica, Natalya Gomez, and Peter U. Clark build the observations into a new model of a melted world. The authors estimate the effects of two other phenomena as well. The weight of ice transforms the ground beneath it, pressing bedrock farther down than it might otherwise “want” to be. Absent the ice sheet, this land might recoil, expelling water that would otherwise settle above it and move the Earth’s axis of rotation about a third of a mile, with its own influence on water sloshing about the seas. Sea-level is notoriously difficult to model, and occurs over time periods long-enough to seem ridiculous if your primary diurnal concerns are more along the lines of buying frosting than creating a long-term national flood insurance program. But that’s the interesting thing about climate change, isn’t it? Models aren’t (neessarily) forecasts. They are specific predictions based on specific assumptions, a way to investigate how the Earth behaves based on our limited but ever-improving obervations. Travels to foreign lands interfered with posting about NOAA Administrator-nominee Jane Lubchenco’s Senate confirmation hearing last week. She is a Distinguished Professor of Zoology at Oregon State University, and a prominent voice guiding U.S. policy and non-governmental efforts to study and protect the watery part of the world. Lubchenco served on President Bill Clinton’s National Science Board and contributed to a National Academy of Sciences climate change report for George H.W. Bush. She is also a Nicholas Institute Advisory Board member, and provided impetus for the creation of Real Oceans, believing that there should be a Web resource to learn about holistic stewardship of ocean ecosystems. These are just some issues — all kinds of fun — that await Lubchenco’s confirmation, which is expected after the nominee for Commerce Secretary. Scientists from the U.S., U.K., and Canada and recently discovered an entire ocean in the belly of a fish. Rod Wilson is an animal physiologist at the University of Exeter who, with Martin Grosell (U. Miami), has spent the last several years elucidating how fish make calcium carbonate in their intestines. Fish drink seawater rich in calcium and magnesium. It concentrates in their digestive tracks and these ions, which fish might otherwise only use for kidney stones, meet up with carbonate ions. Coccolithopohres and foraminifera are the 800-lb. plankton of the ocean carbon cycle. Their shells drop through the water column, perhaps packaged in bulk by copepods, transporting inorganic carbon to the deep ocean. It tends to dissolve below the lysocline, where the carbonate concentration of the water dips below favorable pH and pressure conditions for keeping it in tact. The problem with this picture is that scientists have long detected aberrations in alkalinity much higher than the lysocline at which calcite shells tend to dissolve. It’s been an oceanography mystery for decades. Fish make a different kind of carbonate crystal than the phytoplankton — aragonite, which has a marked higher amount of magnesium. As a result of this difference in composition, aragonite dissolves higher in the water column than calcite. Wilson presented this example of good piscine renal hygiene while visiting the University of Miami. The study was met with interest by Frank Millero, the distinguished marine chemistry scientist, who pointed out that Wilson and Grosell might have stumbled on to a clue to very big problem: Why scientists observed the effects of dissolving carbonate so much higher in the water column than expected from calcite. The three of them teamed up to see if fish might be responsible for the mystery. The trick would be to estimate how much carbonate fish leave behind and then multiply it by the number of fish in the ocean, to arrive at a sense of just how much calcium carbonate the fish are producing. Easy. How many fish are in the ocean? The typical answer you hear these days — “Not as many as there used to be” — was too imprecise. No one had calculated how many fish might be in the ocean! “That was a big surprise,” says physiologist Grosell. The team brought on Simon Jennings (U. East Anglia) and Villy Christensen, who contributed modeling estimates, figuring a total fish biomass in the vicinity of 900 million to 2 billion tons. That yielded a conservative range of 3 to 15 percent of all surface ocean calcium carbonate — originating in fish guts. The new president will spend the day attending a prayer service at the National Cathedral and later, meeting with his Joint Chiefs and economic advisers. As Barack Obama acclimates to the presidency, we’ll dip into the recent past. Former President George Bush on Jan. 9 issued a presidential directive that refines U.S. national interests in the Arctic. The eight-page document took two years to finalize and is the first White House statement on national security and the Arctic since Bill Clinton was president, in 1994. The directive emphasizes U.S. national security and energy interests in the area, particularly given the changing climate and the likelihood of increased human and commercial involvement in the region. The Bush administration also commended progress within the Artic Council — the body of nine nations and indigenous peoples that the outgoing president didn’t always please. Bush gave the Senate a final prod to pass the U.N. Convention on the Law of the Sea. The week after the White House released the directive, the Joint Ocean Commission Initiative (JOCI) met in Maryland, to hash out recommendations for the new administration. Climate change and Arctic policy topped the list. How will the National Security directive affect, inform, or influence the new administration’s approach to this rapidly changing area of the world? Only time will tell. President Bush last week designated nearly 200,000 square miles of Pacific islands, reef, waters, and floor as protected, under the century-old federal Antiquities Act. This announcement sent the mainstream press racing for their globes and atlases, and momentarily put oceans at the center of the national conversation. Outlets that cover marine issues intermittently embraced the event, for better or for worse. The New York Times editorial board took this thoughtful stance on the perceived shortcomings of Bush’s move. More interesting than the news-driven coverage was The Economist‘s Special Report on the Sea, which ran in its Jan. 3 to Jan. 9 issue (Lead story is here, with links to others on the right). It’s rare to see the mainstream press devote such resources to this small corner (okay, 70 percent) of the world. True to form, Economist editors build an arc of logic into the package, opening with exposition about the state of the seas, before sliding into, if not policy prescriptions, commentary on politicians’ ineffectiveness on the issue (From “Saline Solutions“: “Is it too late to save the sea? The solutions to some of its problems are fairly clear, even if it requires political courage to put them in place.”). A less obvious point lay scattered over the entire 16 pages. Readers of the Economist know that editors commonly save brain space on writing headlines and subheads by ripping forgotten gems out of antiquarian literature. This practice is particularly apt in this oceans package. The articles themselves directly address major, present concerns. The sprinkling of literary references throughout stories and captions has a subtle but powerful effect: Humanity has always lived and thrived by the sea. The ocean is a part of our identity, our history, and, because we eat so much fish, our bodies, too. Here is a list of most of these references, which all in all cover about 2,500 years of cultural history — a fraction of humans history with life by the sea. When President-elect Barack Obama nominated Jane Lubchenco as NOAA administrator, the oceans community cheered. Yesterday, when he asked Leon Panetta to direct the Central Intelligence Agency, the response was more guarded – and not because the oceans community is particularly entrenched in The Company. Maybe we should be. Panetta chaired the Pew Ocean Commission, whose comprehensive 2003 report on ocean governance remains an indispensible policy Bible. He continued to grind away on ocean issues as the co-chair, with Bush-41 Energy Secretary Admiral James Watkins, of the Joint Ocean Commissions Initiative. Blue-ribbon panels are a major slice of the Washington, DC, economy, yet commission chairmen who remain advocates of thick-report recommendations are few and far between. So, when the Panetta-CIA announcement came, the oceans community suddenly lost an influential advocate to a new, all-consuming full-time job. The population of high-profile oceans champions is dwindling. Politics and scandals have removed Rep. Wayne Gilchrest (R-MD), who lost his primary against a conservative Republican; Rep. Tom Allen (D-ME) who lost a Senate bid; and Sen. Ted Stevens (R-AK), lost a Senate race that was close even though he ran under a seven-count indictment. Panetta’s enormous job of managing the CIA will leave no time or focus to work on ocean issues. Panetta is indeed, a big loss, considering the extraordinary effort he gave to ocean issues. I nonetheless find myself very pleased about this appointment. The CIA is in desperate need of an outsider with a deft hand and a keen intellect to change its course. Panetta has proved himself a bi-partisan organizer of difficult constituencies by handling the many different voices on the Iraq Study Group. He managed a feisty – feistier? — mix of economic, social, and political interests with the Pew Ocean Commission and JOCI. How might Panetta’s oceans advocacy inform his tenure as director of Central Intelligence? He has a vivid understanding of democracy. The U.S. is an open society, and the American public is owner and trustee of its government. Panetta has engaged the public to apply these ideals to our stewardship of the oceans. He helped create the California State University Monterey Bay at Fort Ord Army base and the Panetta Institute, a nonpartisan public policy center. Panetta is an advocate of the “Public Trust Doctrine”: the idea that American resources belong to all citizens. These resources are only held in trust by our government — with a solemn responsibility to protect and grow them. The Public Trust Doctrine is a powerful and unifying concept for ocean conservation. What specifically does the public trust have to do with the CIA – by definition the very opposite of an “open society”? From my work on “Natural Security,” I have observed that the most successful and adaptable organisms distribute power and surveillance to many semi-autonomous problem solvers – in fact, complexity scientists call them “agents.” In nature, these problem-solvers might be as diverse as cells in the immune system, chromatophores in octopuses, or specialized individuals in a colony of tunicates. In a democratic society, these problem solvers can be the citizens themselves. Senator Gary Hart–who was thinking and working on terrorism issues long before 9/11 — has been adamant about a similar point: The more information we provide people, the safer we are. The outgoing administration has spent the last eight years pursuing the opposite track – and not only in national security policy. I don’t know how much and in what capacity Leon Panetta can “open up” the CIA. I do believe that his devotion to serving the public trust and his long history with ocean conservation, will lead him–probably more than any previous CIA director—to ideas about security that better reflect the way nature has been doing it for 3.5 billion years. Just in case, I’m sending him a copy of “Natural Security” to help him along. Natural ocean and coastal resources should be considered a vital subfocus of the Obama Administration’s economic revival and long term growth plans. These resources represent a key portfolio of our Nation’s public trust, for which the Obama administration is now the trustee. The solemn duty of the trustee is to preserve the asset base of the portfolio while judiciously allowing uses of some assets and continually striving to grow the portfolio. Just as assets in our economy are inextricably linked, assets in our ocean portfolio are linked with one another and with our resources on land and our Nation’s human resources. Therefore, managing this portfolio means managing users of ocean spaces and resources in a holistic, cooperative manner. This will require a better understanding of the stocks and flows in and out of the portfolio, and the behaviors that are changing those stocks and flows. Moreover, as the recent mortgage meltdown and Ponzi schemes have made clear, assets in a trust portfolio are real and measurable—they cannot be substituted with promises of future gain predicated on entities conjured from thin air. Ocean habitats, clean water, energy potential, fishing jobs, recreation, intact ecosystems and natural beauty are real entities that belong to all Americans and held in trust by our government. The preservation of that trust is a unifying theme that should imbue all of our decisions about managing these resources. A more thorough treatment will be published this spring in Ecology Law Quarterly. A draft manuscript is available upon request. Such is the cry of parents whose young children have an appetite for learning that is sometimes too literal. Over the last year or two we have seen an increase of stories about the effects of toxic plastics on human health, from fetal to adult. The scientist Jacques Monod once commented of genetics, “What’s true for e-coli is true for an elephant.” That goes for the effects of plastics, too. Approximately no one should be surprised that the oceans absorb much of our chemical trash. Still, it was a useful and insightful exercise for Charles James Moore, of the Algalita Marine Research Foundation, to quantify just how much plastic the waters have absorbed – and by extension, the life within them. Moore finds that for two decades we have been flushing plastics out to sea faster than industry produces them for their infinite commercial use. Bisphenol-A, singled out recently in several studies for harm to children, is just one chemical that seeps into marine ecosystems. Styrene, polycarbonates, UV stabilizers, non-stick coatings all break-down over time, but for the most part maintain their molecular integrity. When a foam coffee cup dematerializes to the four corners of the Earth, it doesn’t disappear, but soaks up other toxins before entering the food chain. Scientists have identified 267 species worldwide that ingest plastic debris, including albatross, fulmars, shearwaters, and petrels, which confuse plastic for food; 44 percent of seabird species; and sea turtles that munch on plastic bags and fishing line. Macroscopic debris – diapers, syringes, etc – washes up on beaches, unsightly and potentially harmful. 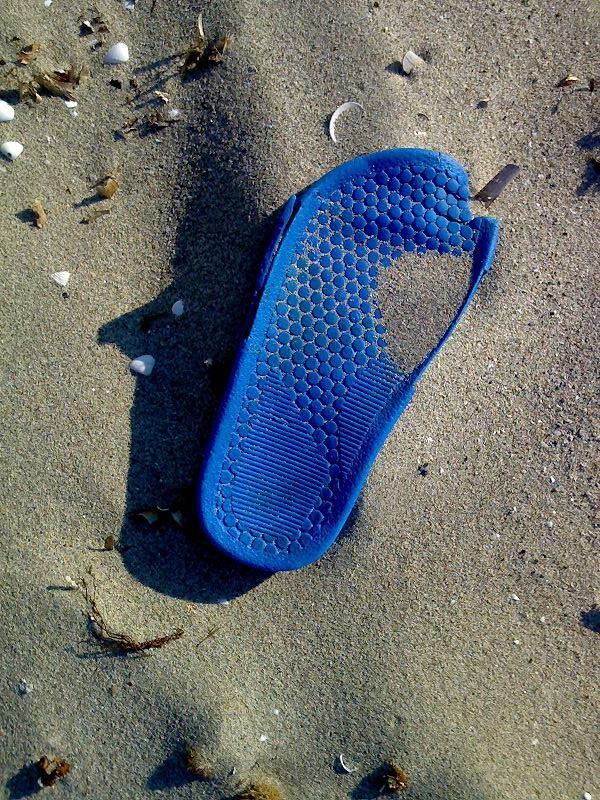 Some plastic debris looks like and weighs as much as food, but is only a toxic substitute. Hydrocarbon-based synthetic compounds tend not to biodegrade. They can also provide a home to barnacles, worms, and other undesirables, and float them across the sea, where they become invasive species. Many unprocessed plastics are shipped from suppliers to factories in the form of tiny resin pellets. At sea, these pellets and other plastic debris emit and absorb endocrine disrupters and other pollutants. Debris falls through the water column and disrupts both benthic ecosystems and deep-sea deposition of CO2. Coastal species see their nursery habitats poisoned by anthropogenic litter. Plastic waste clogs ship intake ports and wraps propellers, costing time and money. SOURCE: Moore, Charles James. “Synthetic polymers in the marine environment: A rapidly increasing, long-term threat.” Environmental Research 108 (2008): 131-139. A scientific adventure that began with a haul of 10,000 bioluminescent jellyfish off Friday Harbor during 1961 has resulted in the 2008 Nobel Prize in Chemistry. Osamu Shimomura‘s career shot forward in 1956 when he isolated a luminescent protein found in the mollusc Cypridina. This was a major feat for a young researcher, particularly since U.S. scientists had worked without success for some time on it. Princeton University snapped up Shimomura, who was awarded a PhD from Nagoya University without even being a doctoral candidate. He now works at Connecticut College. Once in the U.S., Shimomura turned his attention to the jellyfish Aequorea victoria. Over the course of 1961, he and a colleague gathered and sliced the edges off 10,000 jellyfish — the parts that glow — and mashed them into a condensed form. 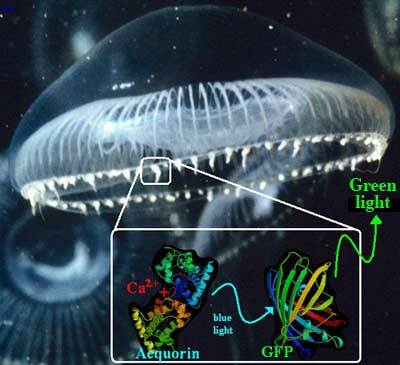 Back at the lab, the scientists discovered that the material glowed brightly, when activated by the calcium ions in seawater. They named this brightening protein aequorin. Aequorin contains a chromophore that has become a pivotal investigatory tool for biochemical researchers around the world. This “beer-can-shaped” protein absorbs blue and ultraviolet light, then re-emits it at a green wavelength. Today, scientists use this molecular flashlight to illuminate cancer tumors as they grow, track the progression of Alzheimer’s, and map the basic function of cells. With Green Fluorescent Protein, researchers can watch a single protein move about a cell. Shimomura shares the prize, one-third each, with colleagues Marty Chalfie of Columbia University and Roger Tsien of UC-San Diego. The U.S. House of Representatives yesterday voted to lift the generation-old ban on oil drilling on the Outer Contintental Shelf, thus bringing to resolution the year-long ascension of the issue from oil-industry wish list to national policy. Democrats, ostensibly the party in control of both houses of Congress, caved in to a forceful Republican minority, and an even more forceful president, who threatened to veto any spending bills that preserved the moratorium. Offshore drilling became a mantra through the summer, when politicians strove to find a rhetorical palliative to record-high gasoline prices. The drilling ban was never based on anything that might pass for scientific research. Through the 1970s, the Nixon, Ford, and Carter administrations, Washington kept something of an implicit, even-keeled balance between exploiting natural resources and maintaining environmental protection offshore. That changed in January 1981, when President Ronald Reagan nominated James Watt to be Secretary of the Interior. Watt has a distinguished career as secretary, which included kicking the Beach Boys out of a DC Fourth of July celebration, explaining the diversity of his staff by pointing out he employs “a black, a woman, two Jews and a cripple,” and also by disrupting this unspoken balance between industry and the environment. Watt moved to open coastal waters to more exploration, breaking the implicit deal, an action met by outrage by the environmental community. The Sierra Club organized a petition campaign to push back Watt’s heavy hand. The trouble was, what did they want to push it back to? As a practical matter, it was difficult to say what the best solution to the problem was; it would take too much time, thought, and effort to try and gerrymander an equitable system of where thou shalt drill and where shalt thou not. So the Sierra Club petition, eventually signed by 1 million Americans, called for moratoria on drilling in U.S. waters off the East and West coasts. The easiest answer was taking the whole OCS off the table. Will Rising Tides Lift All Boats? Global climate models have difficulty resolving possible regional impacts of global warming. The Center for Economic Forecasting and Analysis at Florida State University recently tried to address this shortcoming by taking a ground-up approach to predicted sea level rise and its possible economic implications. A new report (link in .pdf) is called Climate Change in Coastal Areas of Florida: Sea Level Rise Estimation and Economic Analysis to Year 2080. Julie Harrington and Todd L. Walton Jr. look at six Florida counties located around the state, from rural to urban. The researchers estimated how high waters might rise using tide data from six stations around the state. Their model returned a range for higher sea levels of 0.23 feet to 0.29 ft in 2030 and 0.83 ft to 1.13 ft in 2080, lower than IPCC general estimates, but both low and high estimates were used to model economic costs. Harrington and Walton used historical damage costs from hurricanes and current property values. Costs associated with sea-level rise top $1 billion under a 0.16 ft rise, but escalate past $12 billion in a 2.13 ft rise scenario. The study does not take into account likely adaptation to rising waters or rising property values. Rather it is meant to identify areas at potential risk and assign dollar estimates to possible damage in a state where 80 percent of the population lives in coastal counties and that relies on coastal tourism for 10 percent of its income. A new report concludes that assigning individual property rights within the fishing industry staves off ecosystem collapse more frequently than other types of governance. Management policies that assign catch rights to individuals may better stave off fishery collapse, according a report in Science. Christopher Costello, Steven D. Gaines, and John Lynham assembled a worldwide database of fisheries and catch statistics in 11,135 fisheries, from 1950 to 2003. By 2003, fisheries that have deployed “individual transferable quotas” collapse about half as frequently as fisheries that have no catch rights. Costello, Christopher, Steven D. Gaines, John Lynham. “Can Catch Shares Prevent Fisheries Collapse?” Science 321 (19 September 2008): 1678-1681. See accompanying article, from which title of this post comes: Stokstad, Erik. “Privatization Prevents Collapse of Fish Stocks, Global Analysis Shows.” Science 321 (19 September 2008): 1619.